The doom metal band Lucifer has returned with another ’70s-era hard rock burner that takes off like napalm and never quite extinguishes. The album Lucifer II arrives with that same deliciously retro, bottomed-out sludge that sounds like unholy animals trying to shake off a tar bath. That old metal sound that started with Black Sabbath and stretched its way up to the early ’80s before the genre blew itself apart and was scattered into way too many fragments. 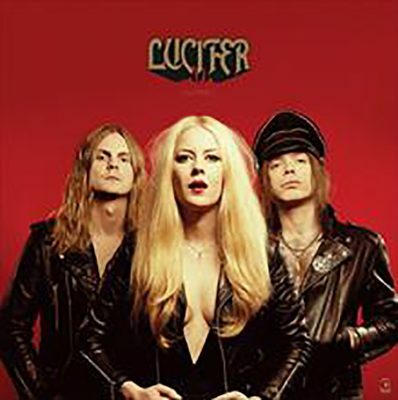 With this new album, Lucifer make the future the past and right in the middle of this rock n’ roll occult revival is the mystical, seductive enchantress Johanna Sadonis. Sadonis was born in Berlin to a Christian family—her grandfather was a high-ranking member of the Berlin Protestant Church. Somewhere in her youth, Sadonis found the devil and sold her soul to rock n’ roll. Sadonis absorbs those familiar sounds and adds her dreamlike devil-and-doom lyrics, pushing her tone with an upside-down cross across the entire record. In doing so, Sadonis may have conjured up one of the best true heavy metal albums in almost four decades—retrieving it straight from the depths of its original furnace. Sadonis has kept her vision intact from the last album, Lucifer I, but reinvented the entire band, bringing in multi-instrumentalist metal sensation Nicke Andersson (The Hellacopters, Entombed) and guitar wizard Robin Tidebrink. The three were the creative spirit behind the recording of the album. The band will add Martin Nordin (guitar) and Alexander Mayr (bass) for their live and touring lineup. The new album was recorded in the metal-friendly Stockholm, and Lucifer II boils, bubbles and pops out of Sadonis’ witch’s cauldron. Andersson and Tidebrink help Sadonis haunt every dark corner of this record. Lucifer II starts out with the blisteringly devil-may-care road song of “California Son” and ends with the pleasantly over-the-top doom of “Faux Pharaoh.” These two tracks bookend a group of songs without one throwaway track. Lucifer even dare to cover a Goats Head Soup–era Rolling Stones track, “Dancing With Mr. D,” and easily make it their own. The Jagger/Richards song fits Sadonis perfectly when she sings, “Human skulls is hangin’ right ’round his neck / The palms of my hands is clammy and wet.” Lucifer let us know the dance is real. Tidebrink is clearly having fun here. With his Keith Richards–dirty, sick blues and Iron Maiden–speed guitar runs, he owns such songs as “Phoenix” and “Eyes in the Sky.” Andersson is the perfect henchman to help deliver Sadonis’ vision—he is able to get this thing up and moving and give life to this fantastically put-together Frankenstein monster. The tone of this album never wavers. The film equivalent of this record would be the greatest B-movie horror show in the history of cinema. You don’t believe me? Check out the videos. Film exaggerations aside, this is a straight-up fun record. If you look at it through a heavy metal filter, it’s a great one.